April arrivals: March came in like the proverbial lion, but it's certainly not going out like a lamb. Indeed, Disney and Mandeville Films' "Beauty and the Beast" continued to roar atop the boxoffice last weekend with $88.3 million and a 10 day cume of $317 million. Disney said Sunday that "Beauty" also grossed $119 million internationally last weekend "to push its global cume to $690M ($317M domestic, $373M international). Now the #1 movie of 2017 domestically and globally, this is the fourth consecutive Walt Disney Studios release to surpass the $600M mark globally, following 'Doctor Strange,' 'Moana' and 'Rogue One.'" "Beauty's" $317 million domestic cume, per Disney, is "the 4th largest 10-day cume for any film as well as the 4th largest second weekend of all-time. "Internationally, 'Beauty and the Beast' opened strongly in France, Australia and Argentina this week, especially Argentina where it was the second highest live action admissions opening in industry history. In the UK/Ireland, 'Beauty and the Beast' delivered the 3rd biggest second weekend ever (behind only 'Skyfall' and 'Spectre') and March's biggest ever second weekend. The film has yet to open in Japan (April 21). International holds were strong in many markets, especially considering coming off such a substantial $182M opening weekend. "The performance of 'Beauty and the Beast' has helped The Walt Disney Studios cross $1 billion globally last Tuesday (estimated $1.3 billion as of end this weekend)." Last weekend also got a power boost from a much better than expected launch for Lionsgate and Saban Entertainment's PG-13 rated sci-fi action adventure "Power Rangers," which placed second with $40.5 million. Hollywood tracking had suggested a likely opening in the $33 million to $35 million range, but Lionsgate's marketing clearly scored big with the film's core audience of younger and adult men. 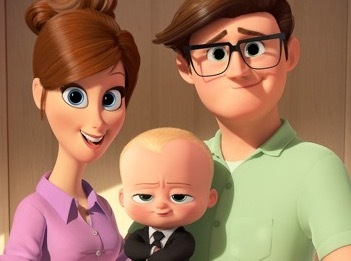 This weekend, which is split one-third March and two-thirds April, should be a happy one with the arrival of 20th Century Fox and DreamWorks Animation's PG rated 3D animated comedy "The Boss Baby" at about 3,700 theatres. Directed by Tom McGrath ("Madagascar" and two sequels), it's based on the book by Marla Frazee. Its voice stars include: Alec Baldwin, Steve Buscemi and Lisa Kudrow. "Boss" should play best to families, but it could also pull in some of Baldwin's young adult "Saturday Night Live" fans. Also arriving is Paramount and DreamWorks' PG-13 rated 3D sci-fi action crime drama "Ghost in the Shell" at about 3,200 theatres. Directed by Rupert Sanders ("Snow White and the Huntsman"), it's based on the comic book by Masamune Shirow. Its stars include: Scarlett Johansson, Michael Pitt, Juliette Binoche and Rila Fukushima. Like most sci-fi films, it should play best to men. Johansson plays The Major, a unique special ops human-cyborg hybrid leading Section 9, an elite task force that targets the world's most dangerous criminals and extremists. They're confronting an enemy out to destroy Hanka Robotics' advancements in cyber technology. Although April should be off and running well, March will be a tough act to follow. comScore senior media analyst Paul Degarabedian pointed out Sunday that, "March 2017 crossed the $1 billion mark this weekend and is now the biggest month of March ever!" Here's a quick preview of other wide openings in April that will lead up to summer's unofficial early start May 5 with Disney and Marvel's "Guardians of the Galaxy Vol. 2." APR. 7: Columbia and Sony Pictures Animation's 3D animated comedy adventure "Smurfs: The Lost Village" should keep the multiplexes busy with parents who've already seen recent animated family films like "The Batman LEGO Movie" ($170.8 million through last weekend) and "Boss Baby" and are now ready for something new to enjoy with their young kids. "Smurfs" is from "Shrek 2" director Kelly Asbury and stars the voices of Ariel Winter, Michelle Rodriguez, Julia Roberts. This time around, Smurfette and her friends are racing through the Forbidden Forest to find a mysterious lost village before the evil wizard Gargamel gets there. They're on track to discover what's said to be "the biggest secret in Smurf history." The franchise's last episode, "The Smurfs 2," opened July 31, 2013 to $17.5 million and did $71 million domestically. It did about $276.5 million more internationally. New Line Cinema, MGM, Warner Bros. and Village Roadshow Pictures' PG-13 rated crime comedy "Going in Style" is directed by Zach Braff ("Wish I Was Here"). Starring are: Michael Caine, Morgan Freeman and Ann-Margret. It should play best to adult men. In this new version of the 1979 original – which was directed by Martin Brest and starred George Burns, Art Carney, and Lee Strasberg -- three seniors scraping by on social security decide to rob the bank where they all lost their money. APR. 14: Universal and Original Film's PG-13 rated action crime thriller "The Fate of the Furious" is a safe bet to rev things up at the multiplexes. Directed by F. Gary Gray ("Straight Outta Compton"), it stars Charlize Theron, Dwayne Johnson and Kurt Russell. It should play best to the franchise's male action movie fans. In this episode, the globetrotting team's found a semblance of a normal life, but when a mysterious woman (Theron) seduces Dom (Diesel) to re-enter the world of crime and betray those closest to him, they're pushed as never before. The seven episodes since the series began in 2001 with "The Fast and the Furious" have grossed $1.3 billion domestically. The last episode, "Furious 7," opened Apr. 3, 2015 to $147.2 million and did $353 million domestically. It also grossed a turbo-charged $1.2 billion internationally. Lionsgate's R rated action thriller "Altitude" is directed by Alex Merkin ("House of Bodies") and stars Denise Richards, Jonathan Lipnicki and Dolph Lundgren. It should play best to adult men. Richards plays an FBI agent flying to Washington when the man in the next seat tells her their plane's about to be hijacked. He says he'll pay her $75 million dollars if she can get him safely back on the ground. She sees soon enough that he's not joking about the hijacking and finds herself in the middle of an elaborate mid-air heist. Open Road Films' PG rated animated comedy adventure "Spark: A Space Tail" is directed by Aaron Woodley ("The Entitled") and stars the voices of Patrick Stewart, Susan Sarandon and Jessica Biel. It should play best to families. Spark (voiced by Jace Norman) is a teenage monkey on a mission with his pals Chunk (Rob deLeeuw) and Vix (Biehl) to recapture the planet Bana, which has been taken over by the villainous Zhong (A.C. Peterson). APR. 21: Warner Bros. and DiNovi Pictures' R rated thriller "Unforgettable" is from first time director Denise DiNovi, a veteran producer with credits like "Crazy, Stupid, Love" and "The Sisterhood of the Traveling Pants" series. Starring are: Rosario Dawson, Katherine Heigl and Cheryl Ladd. Heigl plays a psycho ex-wife out to destroy her ex-husband (Geoff Stults) and his new wife's (Dawson) lives. It should play best to adult women. Disney Studios and Disneynature's G rated documentary "Born in China" is directed by Chuan Lu ("Chronicles of the Ghostly Tribe") and is narrated by John Krasinski. It should play best to families. "Born" takes moviegoers into the wilds of China where very few people have ever been. It focuses on three animal families – including a panda bear mom guiding her baby as she begins to explore and seek independence. Also competing for family audiences is The Weinstein Company's PG rated animated comedy adventure "Leap!" from first time feature directors Eric Summer & Eric Warin. Its voice stars include: Elle Fanning, Dane DeHaan and Carly Rae Jepsen. It's the story of an orphan girl in France who dreams of becoming a ballerina. After leaving her country home for Paris, she's mistaken for someone else and becomes a student at the Grand Opera House. Open Road Films' PG-13 rated historical drama "The Promise" is directed by Terry George ("Hotel Rwanda") and stars Christian Bale, Oscar Isaac and Shohreh Aghdashloo. It should play best to adult men. Set during the last days of the Ottoman Empire, it's about the love triangle between a brilliant medical student (Isaac), a beautiful and sophisticated young woman (Charlotte LeBon) and a well known American journalist (Bale) based in Paris. A24's R rated action crime comedy "Free Fire" is directed by Ben Wheatley ("High-Rise") and stars Enzo Cilenti, Sam Riley and Michael Smiley. It should play best to adult men. Its story takes place in 1978 Boston where a meeting between two gangs in a deserted warehouse leads to a shootout that prompts a game of survival. APR. 28: STX Entertainment and Playtone's sci-fi thriller "The Circle" is directed by James Ponsoldt ("The End of the Tour") and stars Emma Watson, Tom Hanks and John Boyega. It should play best to adult men, the core audience for most sci-fi movies. Watson plays Mae Holland, who's hired by a global giant tech and social media company and encouraged by its founder (Hanks) to be part of a revolutionary experiment pushing the boundaries of privacy, ethics and personal freedom. Lionsgate's Hispanic studio arm Pantelion Films' PG-13 rated comedy "How to Be a Latin Lover" is from first time feature director Ken Marino and stars Eugenio Derbez, Salma Hayek and Rob Lowe. It should play best to adults. It's about a man whose wife dumps him after 25 years of marriage, ending his long career of seducing rich older women. After he moves in with his estranged sister, he finally learns the value of family. Bottom line: As good as last weekend was, it just couldn't beat last year's comparable weekend when "Superman v Batman: Dawn of Justice" opened to $166 million. That was the biggest March opening ever until "Beauty and the Beast" danced into theatres this Mar. 17 with $174.5 million. All films in the marketplace last weekend grossed about $199 million, per comScore – down 21.1 percent from $252.1 million this time last year. 2017's $2.793 billion boxoffice total to date, according to comScore, is up 5.5 percent vs. $2.648 billion this time last year. A week ago, comScore's tracking showed 2017 up 5.8 percent, a big improvement over the prior week when this year was only ahead 0.3 percent.